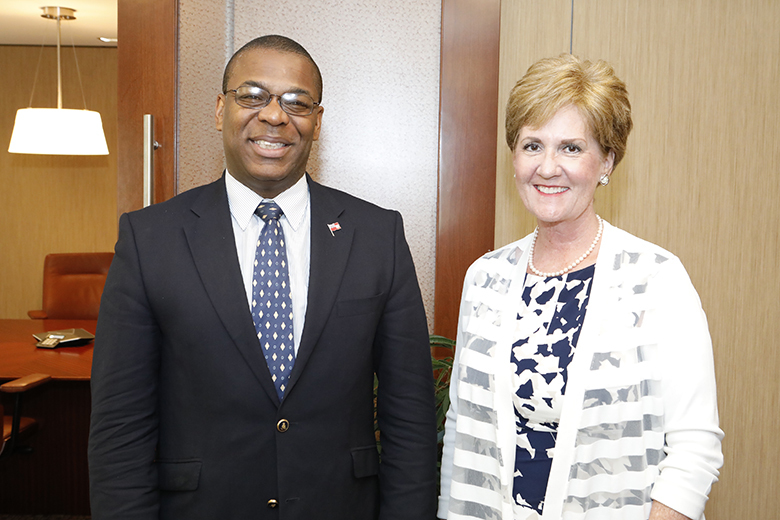 Today the [June 25] U.S. Consul General Constance M. Dierman made a courtesy visit to the Deputy Premier and Minister of Transport and Regulatory Affairs Walter Roban. Ms Dierman recently replaced Mary Ellen Koenig as the island’s U.S. Consul General, with the career diplomat having previously served in locations including Kabul, Baghdad, Bridgetown, Canberra, Geneva and Washington, D.C. Elephant in the room – what the ??? is your fascist government doing to the world?? Not sure she would have said that to Walter. Yes, someone should ask him that. least we cast stones when looking out of our glass house! A warm welcome to Ms Dierman.